Stout to decidedly barrel-shaped, the trunks of most of the species of Brachychiton that line some of our streets are decidedly architectural. Graceful they may not be, but their swollen stems still make them delightful to behold. Most are native to Australia and find our climate just as agreeable as their own. The oversized trunks serve a function in the long dry season that they encounter on either side of the equator-storing up water-and make them perfect for our landscapes. A few of the bottle trees also have stunning floral displays. In fact, another common name for a couple of them is flame tree. The brightest is Brachychiton acerifolius. Before the leaves begin to unfurl from the bare branches at the end of summer, the flame tree’s aerial portions are fire-engine red. The flowers are small, bell-shaped, and born in a profusion of open bunches. The twigs that support them as well as all the smaller branches are clothed in a matching scarlet that serves to make the whole tree glow. Fully grown trees can reach 60 feet, so this is quite a show. As they finish their reproductive duty, the flowers fall and create an unbroken carpet of red for one last hurrah. That’s not the end of the show for this tree, however. Large (up to eight inches long) seed pods, looking like black canoes, follow the flowers. They split along their entire length to reveal as many as 20 seeds. These ornamental pods eventually fall or can be knocked down to incorporate into craft projects such as wreaths and other dry arrangements. The pink flame tree (B. discolor) has deep-pink tubular flowers with a flaring five-lobed corolla. While the flowers are larger, they are fewer, but the effect is still lovely. Similar pods follow the flowers, but in this species, they are covered with a soft, light-brown fuzz. Pink flame trees can grow to 50 feet, so are suited only for larger landscapes. Many Brachychiton species have more- or less-acutely lobed leaves, similar to maples. An exception is B. populneus. As its species name suggests, the leaves are similar to those of a poplar, even twirling in the breeze quite like the quaking aspens (all aspens, cottonwoods, and poplars are in the genus called Populus). The blossoms are not nearly as showy as the flame trees. These small bells are pale pink inside and apple green on the outside. But as with their kin, they produce stubby boat-shaped pods that open to reveal bright orange seeds. The Brachychiton with the claim to fame of fattest and shortest trunks is B. rupestris. It may only reach 25 feet in height, but can be as much as 15 feet in diameter. When the trees are young, their leaves are divided into threadlike leaflets, but once it matures, leaves become larger and undivided. If you should grow one long enough for that event, which is much more delayed than in other species, the flowers are small and pale yellow. There are two hybrids of Brachychiton that one may encounter. B. gregorii (a natural cross between B. populneus and B. occidentalis) is, unlike the others mentioned here, an evergreen. Its shiny, pink flowers are somewhat showy and precede a fuzzy pod similar to its B. populneus parent. The Sexton flame tree was created by area nurseryman Joseph Sexton (1842-1917) by crossing B. acerifolius and B. populneus (taxonomists have given it the official name of B. X roseus). It displays a hybrid vigor by topping out at 70 feet in height. 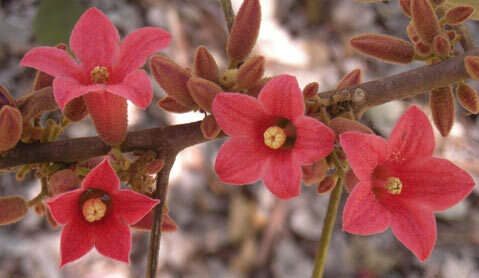 It also sports very bright red flowers similar to its flame tree parent. Efforts are underway to replicate this cross and make more of this handsome tree available. As you may have surmised, flame trees and others in the genus Brachychiton not only are stout, but may be somewhat too large for small gardens. They provide great accents in public landscapes, however. Parks such as Orpet, Franceschi, and Stow Grove are great repositories for them, and the trees in these parks were planted many decades ago, so they are impressive. As street trees, they provide shade and unique identity for the neighborhoods where they have been planted. Several streets on the Westside (look along Gillespie Street and Mountain Avenue), as well as Alamar Avenue and West Cota Street, have grand old specimens.